The Blue Bay Beach Rhodes is situated just next to the beach in the beautiful resort of Ialyssos, also known as Trianda. The resort centre is just 2km away on the west coast of the island and has the added benefit of having an aqua park onsite making this perfect for family holidays. This hotel is only 4 km from the airport, which is great if you can’t wait to get on the rides, slides and chutes in the aqua park as it will only take 10 minutes to transfer you. There are 441 rooms each containing air conditioning, TV and a balcony/terrace. Onsite facilities include the aqua park and if you can drag yourself away from the slides there are also two swimming pools, two kid’s pools, playground for kids and a mini club for kids. There are other great facilities onsite including table tennis, pool table, mini football, tennis, an entertainment programme and an activities programme – what more could you ask for on a holiday to Ialyssos. 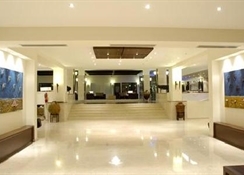 Hotel facilities include swimming pools, children''s pools, mini-club, playground, TV lounge and evening entertainment such as karaoke nights and dancing etc. 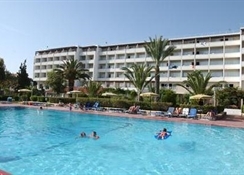 Leisure facilities and activities provided include basketball, water-polo, darts, 2 tennis courts, table tennis, beach volleyball, French boules, mini-football, aerobics and bicycles. Guests also have complimentary entry to the water park several times a week. Further services offered are a conference room, room service (local charge), laundry facilities and internet corner. 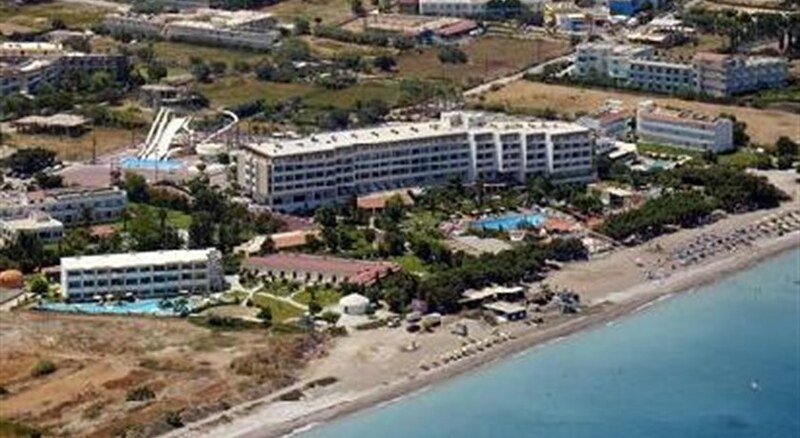 The Blue Bay Resort consists of three buildings; the Blue Bay Hotel with 300 hotel rooms (max. 3 adults), the Bungalows smaller private rooms set in the gardens (max. 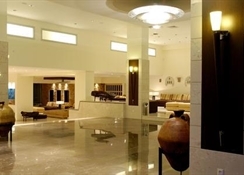 2 adults) and the Family World Centre, situated in a quiet part of the complex with its own swimming pool (max. 3 adults & 1 child). All rooms are equipped with en-suite bathroom, air conditioning, mini-fridge, TV, telephone, hairdryer, safety deposit box and balcony or terrace. Sunland Annex Building Room Type refers to Sunland Hotel 3* All Inclusive situated 100m away from Blue Bay Hotel. Breakfast, Buffet, Daily: 07:00 - 09:30. 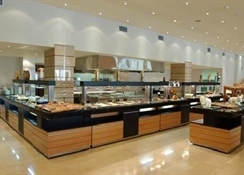 Lunch, Buffet, Daily: 12:30 - 14:00. Dinner, Buffet, Daily: 18:30 - 21:00. Snacks, Daily: 09:45 - 23:00. Afternoon Tea; Coffee Break, Daily: 15:30 - 16:30. Locally produced Alcohol; Locally produced non Alcohol, Soft drinks; Beer; Wine; Juices; Vodka; Gin; Rum; Ouzo, Daily: 10:00 - 23:00. The All Inclusive food and drink information is a guide only and may be subject to change and/or availability and may vary between hotels. Situated just 5mins from the seafront, about 10km from Rhodes town (15min drive) and 8km from the airport. Due to the location of this property, aircraft noise will be heard.